INTRODUCING... With their soaring hooks and glam looks, Joywride are looking to redecorate the charts with a glamourous pop panache. YOU probably think you are too young for nostalgia. Or you probably actually are. But whether you think photos of the Seventies and Eighties are only significant to older generations, or you were actually there, we bet when you look at them you think of the music. And remember when music was about having fun. And being a member of a band was about putting on a performance. And the songs were as big as the hair. And the fans set themselves apart from the mundane.That's the journey we are beginning. That's the journey we invite you to go on with us now... to drive around in a stolen vehicle with no particular goal, a ride taken solely for pleasure... our Joywride. It all began with a chance meeting at a Mexican themed garden barbecue between frontman Ollie Wride and guitarist Josh Dally where - wearing sombreros and fake moustaches and over nachos and tortillas - they feverishly regaled their love of music from the glam pop era, and in particular its honesty. When Josh said: "Yes but you can't really play that kind of music in a band now" and Ollie replied with such certainty "Yes you can!" - Joywride was born. Ollie says "I wanted to put together a glam pop band which is what it is - just that!" The pair then took their time to find the remaining members of Joywride who would share that vision, that turned out to be drummer James Cross (who claims to have been raised by wolves but probably just needs a comb) and bassist Poppy Kavanagh (who wasn't even alive in the Eighties, but looks like she never left it). James explains: "Bands now are all style over substance, we don't want to be that. If it's four people in the room or 15,000, what I like is that we still give it the same intensity. 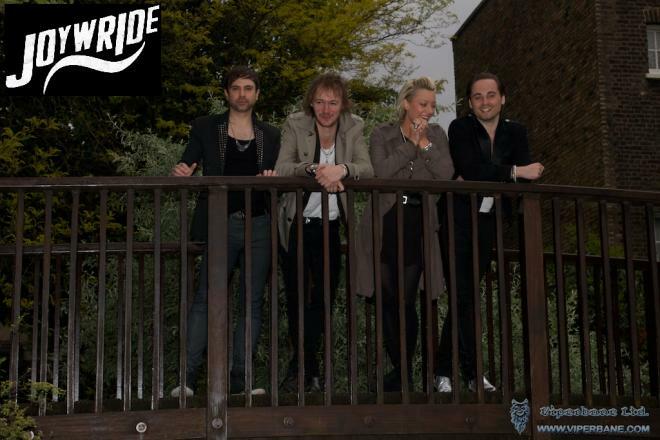 Joywride spend most of their time honing their stagecraft and focussed on putting on a show, as well as spending time writing future pop anthems. Ollie summarises: "We want to be as good as we can before we get there. For me it's about being a performer, whether it is Jagger, Jackson, Mercury, Bolan, ACDC,... even Stevie Wonder, they're all incredible. It's a dying art and we're picking up the baton where our heroes left off." And crafting the kind of songs which will hopefully stand the test of time, not hark back to a bygone era. Josh adds: "I really hope people don't see it as retro, hopefully they won't look at it like that! I hope they see it for the performance and songwriting, they see it for being right for now!"